I know, I know it's a few days late but I hope everyone has had a great start to the new year! At least...better than mine. We left town the day after Christmas and where we were, there wasn't service. Two days gone from home, I get sick. Thought is was allergies at first but kept getting worse. Finally return home for a much needed trip to the doctor to hear I have pneumonia. Today is the first day I feel well enough to coherently type anything but I have a few things in the works and a few changes (hopefully good) to the blog. So please be patient over the next few weeks, everything should be settled by February. I am combining two challenges with this card: #66 Cardabilities Sketch Challenge sketch and Avery Elle's First Challenge AEI♥U Challenge. All paper used is from Dear Lizzy Neapolitan 6x6 Paper Pad, sentiment is from Avery Elle Framed Fonts Stamp Set, prima and petaloo flowers. Hope you enjoyed the first card of the year. Now that is just not a good way to start the New Year, but at least you are feeling better! Don't go over doing anything and built yourself back up! Your card is so pretty! Love the added flowers and decorations! Well, Happy New Year! Very pretty card, love that patterned paper. Oh no!! SO sorry to hear you were sick!! Hoping you feel 100% better soon! I loveeeeeeeeeeeee your card!! LOVING those beads!! Hope that you are feeling better. I love your color choices. Terrific! Beautiful card. I love your cluster of beads and flowers. Great take on this weeks sketch! Happy New Year to you too!! Hope you feel better soon... 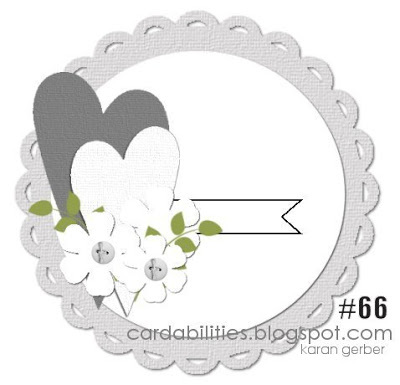 Your card is beautiful and I love that fun cluster of flowers and bead sprays!